credit old man bandyk for sending me the trailer. 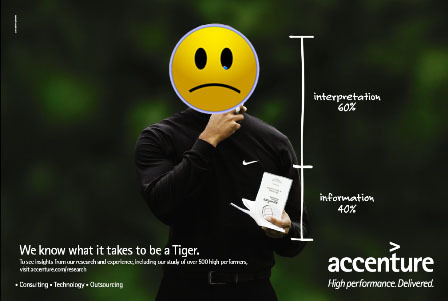 i’m heavily amused by accenture’s extreme efforts to ditch the tiger brand. they probably should not have staked so much of their marketing on one guy. rookie mistake. But it takes time to erase the golfer’s identity completely. Accenture spent $50 million on advertising in the United States last year, and Mr. Woods appeared in 83 percent of the company’s ads — far more than for any of his other major sponsors — according to TNS Media Intelligence. On Tuesday, that meant telling staff members in an e-mail message to review their sales pitches and slide shows to ensure that they “no longer include Tiger Woods.” In New York, employees were asked to bring posters and other physical assets to the company’s front desk for disposal. The company would not comment on exactly how they would be disposed of. i think i have some tiger-branded accenture recruiting brochures. i might just have to hold onto those now. i got stuck in the philly airport before thanksgiving and ended up at a wine bar with classmates. soon after, i realized that every career choice i’ve ever made is basically identical to how i choose to drink wine: every step of the way, i choose the option that allows me to keep my options open as much as possible. on the life side, the same phenomenon occurs. i went to michigan (so many good majors to choose from! ), became a journalist (so many good topics to write about! 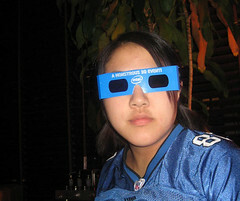 ), went to b-school (unlike med/law, so many options after graduation! ), went to wharton (see michigan), and am now possibly considering consulting (see journalist and substitute “topics” and “write about” with “industries” and “work for,” respectively). this is a problem. some of the people i was with at the airport actually bought full glasses. one guy got a whole bottle. these people make way more money than i do. there is some correlative effect going on here and i want to discover and conquer it. did i just commit myself to being an investment banker?